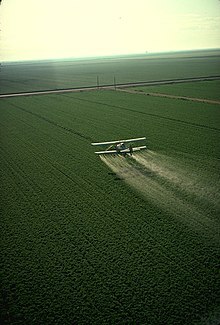 ↑ US Environmental (July 24, 2007), What is a pesticide? epa.gov. Retrieved on September 15, 2007. ↑ Cooper, Jerry and Hans Dobson. "The benefits of pesticides to mankind and the environment." Crop Protection 26 (2007): 1337-1348.,  Retrieved on February 25, 2011. ↑ Sanborn M, Kerr KJ, Sanin LH, Cole DC, Bassil KL, Vakil C (October 2007). "Non-cancer health effects of pesticides: systematic review and implications for family doctors". Can Fam Physician 53 (10): 1712–20. ↑ 4.0 4.1 Miller GT (2004), Sustaining the Earth, 6th edition. Thompson Learning, Inc. Pacific Grove, California. Chapter 9, Pages 211-216. ↑ imentel, David. "Environmental and Economic Costs of the Application of Pesticides Primarily in the United States." Environment, Development and Sustainability 7 (2005): 229-252., . Retrieved on February 25, 2011. หน้านี้แก้ไขล่าสุดเมื่อวันที่ 21 กุมภาพันธ์ 2560 เวลา 03:12 น.